The "Chinese New Year Heroes" series shines the spotlight on artisans who have toiled tirelessly to produce perennial festive goodies. While many have no qualms nibbling on festive snacks, we take a step back to share the hard work behind producing these beloved food items. 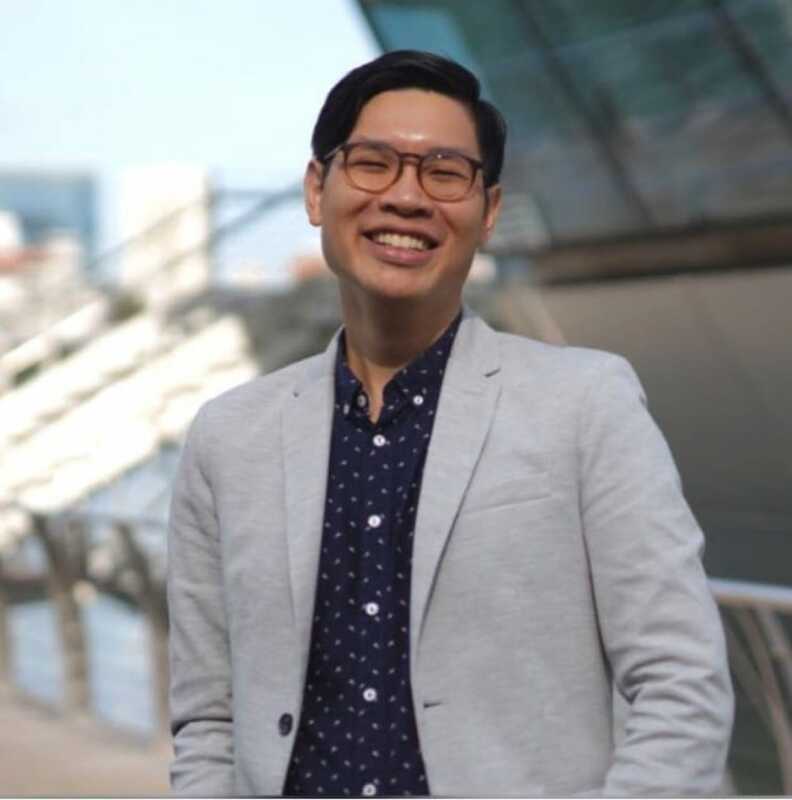 In the second part of the series, Wei Chan, managing director of The Pine Garden, walks us through how pineapple tarts are made from scratch. Chan shows us how the enduring neighbourhood bakery sticks to the manual way of making pineapple tarts despite having expanded into a chain. Popping one — or 10 pineapple tarts at one go has become the requisite food ritual during Chinese New Year. Whether they are open-faced or encased in pillow-shaped pastry, these addictive bite-sized goodies boast a winning combination of a sweet and sometimes acidic pineapple jam and a crumbly and buttery pastry. While many have no qualms polishing off half a jar of pineapple tarts in a heartbeat, not many give a second thought to the vast amount of labour and time that goes behind rolling out each morsel. 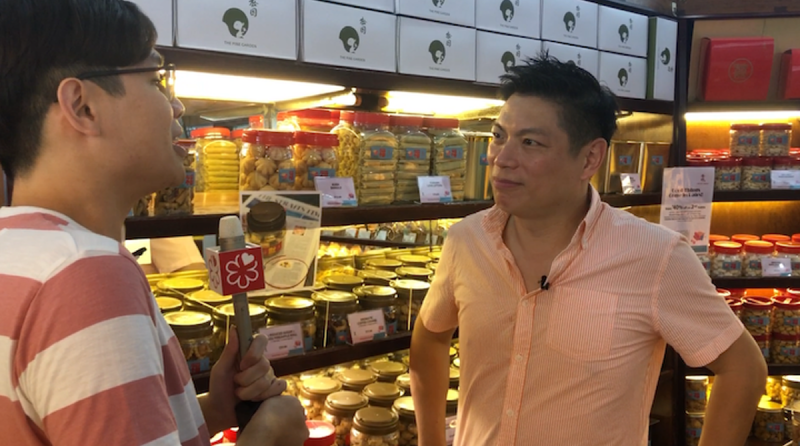 With less than two weeks to Chinese New Year, the MICHELIN Guide Digital spent about three hours at home-grown bakery chain The Pine Garden to learn how to make pineapple tarts from its managing director Wei Chan. The process, which comprises six steps, is labour-intensive. It includes hours of stirring the pineapple jam over the sweltering stove, moulding the dough in flower shapes and rolling out balls of pineapple jam. Mr Wei Chan (right), managing director of The Pine Garden gives us a tour on how pineapple tarts are made at the long-time bakery. According to Chan, The Pine Garden’s open-faced pineapple tart recipe was handed down by his grandmother, who picked it up from her neighbours. His mother learnt the recipe and has been selling them in the bakery for the past 35 years. Not much of the production process has since changed. Most steps are still done by hand — from slicing and grating the pineapples and rolling the pineapple jam to moulding and cutting the dough. At The Pine Garden’s original bakery in Ang Mo Kio Avenue 10, Chan shares that pineapple tarts are its best-selling festive item with more than 3,000 tubs of pineapple tarts sold last year. Production of pineapple tarts is a tedious and mammoth process that typically starts one month before Chinese New Year. It takes a team of about 15 staff to turn out more than 90,000 pineapple tarts annually. Despite having expanded to four other outlets in Singapore, the bakery’s pineapple tarts are still produced by hand. More recently, the bakery has also introduced a yuzu pineapple roll that features a less sweeter jam to cater to health-conscious customers. 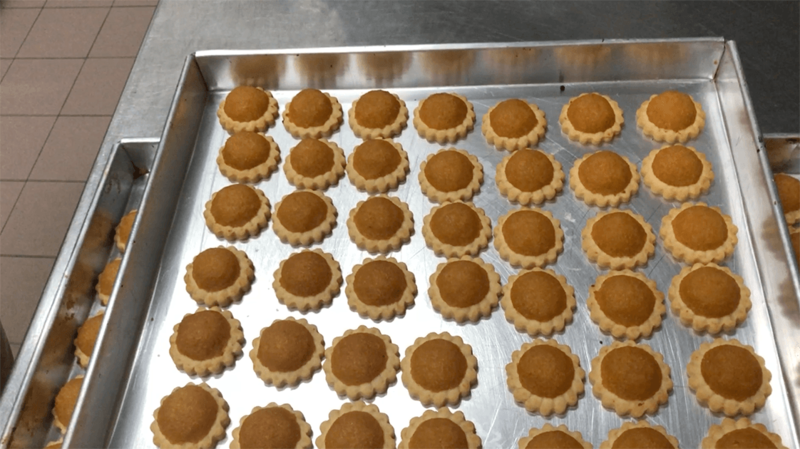 Chan shares with us what goes into making the bakery’s famed pineapple tarts. The Pine Garden's head chef Kerry Chia can grate up to 100 pineapples daily using an old-fashioned brass and wood grater. Only one person is authorised to make the all-important pineapple jam. He is Kerry Chia, The Pine Garden’s head chef, who has been with the bakery for close to 30 years. About 100 pekan nanas, which are from Johor, are processed daily. These pineapples are known for their tart and sour flavours. Every morning, he cuts out the “eyes” from the pineapples diagonally, before grating a pile of peeled pineapples with an old-school brass and wood grater at lightning speed. Each pineapple disappears into pulp and juice within 30 seconds. One cannot help but observe Chia in awe as his bulging arm moves back and forth speedily in this strenuous workout. The pineapple jam are cooked and stirred continuously for close to two hours over high heat until it is caramelised and reduced. After the pineapple pulp is drained, Chia pours it into a huge pot and cooks the fruit slowly on high heat with pineapple juice from the grating and sugar. Chia stands over a searing hot stove and stirs the pineapple continuously — for two hours. While it may seem monotonous, this step is crucial in determining the texture and taste of the pineapple jam. Just a couple of minutes in front of the fire and one’s brows are drenched in perspiration. “It can get very hot,” Chia exclaims, wiping beads of perspiration that have formed on his forehead. Chia cooks 40 to 50 kg of grated pineapple mixture in a huge pot at one time. He also has to look out for any remaining specks of pineapple “eyes” that were not thoroughly removed from the cutting process. Besides the heat, one also needs to take note of the splattering of hot liquid in the pot. To prove his point, Chia points out the scars that have been dotted his arms over the years. Delicate fingers are needed to mould the 2mm-thick dough sheets into flower-shaped cut-outs. Things take a cooler turn as one proceeds to the air-conditioned cold kitchen on the second storey, where the dough is made. 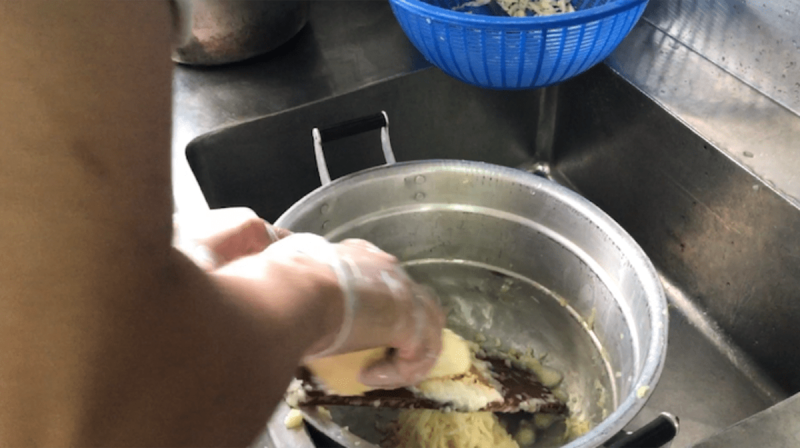 To ensure that the dough is rolled out to 2mm thick, the Chans have improvised a method of flanking each sheet of dough with two acrylic bars before rolling the dough out. Delicate fingers are vital in handling the dough. First, the dough is cut out in a flower shape using a mould, gently twisted and scooped up in one swift but steady swoop. If one hesitates for a second, the dough gets torn or too much dough will be cut out. For a finishing touch, one needs to gently press and tap the flower-shaped dough from the centre of the mould or peel it out with nimble fingers. A handful of staff make the dough while the pineapple jam is rolled out simultaneously. Kitchen staff press down balls of pineapple jam to ensure that they are properly attached to the sides of the pastry dough. While the dough is being moulded, another team prepares the filling. They pinch and roll out 8g of pineapple jam into balls and check them on a digital scale. The balls of pineapple jam are set side. Then, each ball is then placed on a moulded flower-shaped pastry. Here comes the challenging part: Pressing down the ball of pineapple jam ensure that they are properly attached to the sides of the pastry. Chan says: “This ensures that every mouthful of the pineapple tarts gives you some pineapple jam and it does not roll away from the pastry.” Further tapping is required to sculpt each mound of pineapple jam on the pastry. The jam is pressed only with the index finger and thumb on the top of the mound and its sides to keep it in shape. The height of each mound of pineapple jam has to be uniform. A worker takes about 20 minutes to press a tray of about 60 tarts, using the very same technique that has been handed down from Chan’s grandmother. After 20 minutes, the pineapple tarts are baked and ready to be nibbled on. Each tray of 60 pineapple tarts is popped into a 40-year-old oven and baked for 20 to 25 minutes before a buttery fragrance wafts out from the oven. After resting and cooling for about 20 minutes, the tarts are packed in bottles and ready for nibbling.